Frugal & Fabulous: Giveaway: Peggi Li Creations Infinity Necklace! Giveaway: Peggi Li Creations Infinity Necklace! Peggy Li Creations Handmade Jewelry has offered to give away an Infinity Necklace to one Frugal & Fabulous reader! Like the symbol for infinity, the two links are slightly hammered to a bit of sheen. On fine sterling chain, this piece is very delicate, it just floats! Pendant dangles just over 1" long. Choose 16", 18" or 20" long. ($39 value!) As seen on "Private Practice!" Peggy's jewelry designs are deceptively simple, featuring artisan craftsmanship mixed with contemporary approaches to contrast, color, texture and composition. She uses beads, gemstones, vintage findings and Bali charms in her work and tries whenever possible to source from US-based manufacturers. Her metals are 14k gold-fill, gold vermeil, sterling silver, fine silver, Bali silver and real carat gold. Read more about gold-fill and gold vermeil on her blog here. I love the "Dream On Necklace" with the 20" chain. I had a tough time picking one favorite. I love the swirled hoop earings...so cute. Thanks for the great giveaway. I am a subscriber. Thanks for the awesome blog. What a lovely necklace! I really enjoyed checking out Peggi Li's designs! They are so beautiful and her wedding jewelry is amazing! I think my favorite piece is the Chocolate Kiss Necklace. It is gorgeous! I LOVE this necklace - saw it on Private Practice and wanted it then. What a great giveaway! Thank you! I'd love to link this from my blog, but how? I'm having a hard time deciding what I like best... all of her jewelry is beautiful but what first caught my eye was the initial necklace because it looked so delicate and pretty. The Star Charm Necklace is sweet, and who doesn't wish upon a star? Or wish they were a star? Or want to have their very own star? This jewelry is precious and delicate, and shows such gracefulness. I like the Pearl Elegance Necklace.I am renewing my vows in2012 and I think I will order it for the ceremony(it will be 20 years,and we went to a justice of the peace). Gorgeous little bobble. Would love to win. I am posting it on my blog too. I really love the Golden Willow Print Necklace, so pretty! I really like the single dot necklace in gold...goes with everything! I subscribe..enjoy reading your blog. I like the single dot necklace. I love a 20" chain. I really like the Chocolate Kiss necklace. Thanks for the giveaway! i like the chocolate kiss necklace! hahaha its hilarious that i come to your site and find you doing a giveaway...because you just won the askinosie chocolate giveaway on my website! please email me your shipping address so i know where to ship it. congratulations! I LOVE the infinity...I also love the Darling Diamond Star! I would soooo LOVE to see a cupcake! I love a lot of her stuff, but I think my favorite is the diamond tag necklace. I love tis giveaway,,,how sweet. The initial necklace is my fave. A lot of beautiful creations - I like Champagne Pearl necklace best. 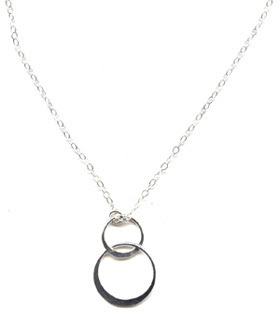 I love the simple circle necklace!!! I love the wishbone charm necklace! I like the jade disc necklace. Those are really cute. I like the Straight to the Heart Necklace. I linked to your giveaway! Love her Lotus Necklace and the Darling Diamond Charm Necklace. I want the Lotus Charm Necklace, although they're all gorgeous. I love love love this necklace!! Please count me in!! I fell in love with the 18 inch white topaz necklace. I love the "delicate leaf" necklace, I'm a nature girl and the silhouette is gorgeous. I love this necklace. So many of these pieces are beautiful. I am a big Silver person. 2. I Am A Money Magnet! 3. I love everything, but I'm gonna say the turquoise slab necklace. I tweeted your giveaway HERE! I liked the "Vintage Floral" necklace. I usually have more of a classic taste, but that necklace kept jumping out at me! :o) I liked the neutral colors and that it was a little funky. Thanks for the reminder, I think I did almost miss this giveaway! I LOVE the Cascading Gold Bracelet AND the Chinese Turquoise Bracelet. I just can't decide which bracelet I love more, LOL! Beautiful jewelry at Peggi Li Creations!